Soft oak tones, cream and stone grey interior, bright yet warm glow of hanging pendant lamps and a stylish exhibition of the most beautifully crafted cakes I think Birmingham has ever seen, awaits you as you walk into The Early Bird Bakery, 28 High Street, Kings Heath. We had heard this brunch spot was edgy, but we were not prepared for the warmth of this hidden gem, 8 minutes drive from Selly Oak. We were greeted by one of the kind faces behind the business, Joe G, with his brother Tim G also circulating himself amongst the customers. Instantly, this affirmed to us that this was not any start-up independent eatery, attempting an authentic rustic feel- this was the real deal. Joe, Tim and Tim C, the professional pastry chef working wonders in the kitchen, were so present in front of house and interacting with the customers- a feeling so genuine that it was almost as delicious as the cakes. Pastry chef Tim C has worked in 5 star Michelin hotels and restaurants in Australia and Malaysia, which is evident in the artistry in the food and display of the baked goods. 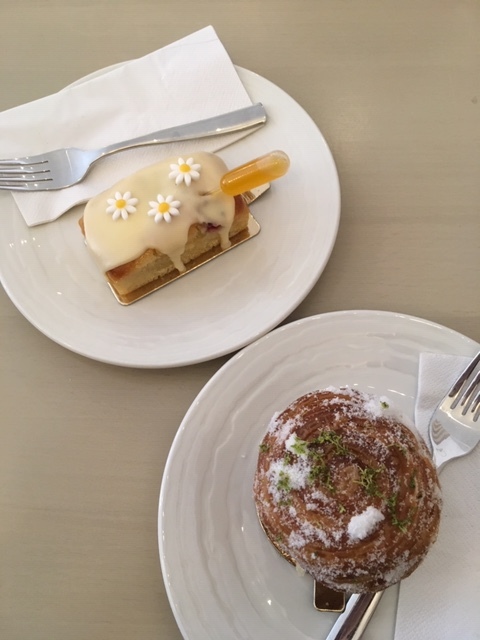 When people say ‘this is a hidden gem,’ they never really mean ‘this is a tiny bakery that serves professional standard cakes and food, in the middle of Kings Heath,’ and we can honestly say that- this really is a hidden gem. And that is somehow, what gives it its charm - it is filled with mums and babies, people passing for coffee or meeting a friend for a sandwich - watching the world go by from their open-window front of the shop. 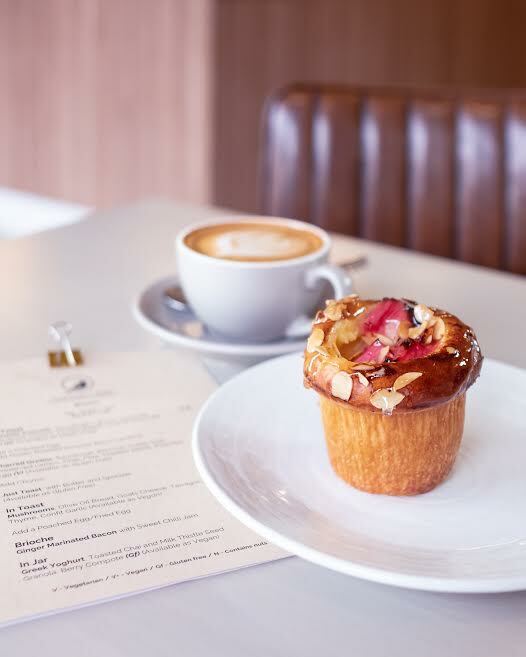 The Early Bird state they want to have ‘food, coffee and people’ at the core of their business, and from the modern yet organic benches, to the back-to-the-front-of-house service, this is achieved and succeeded, ten-fold. Now enough with how much we just LOVE their genuine ethos to know people and food; we ate so much good food, and we are going tell you about it. Having neglected to inform the team of our dietary requirements, oops, we were still incredibly well catered for, and stunned by the dishes that we were provided. 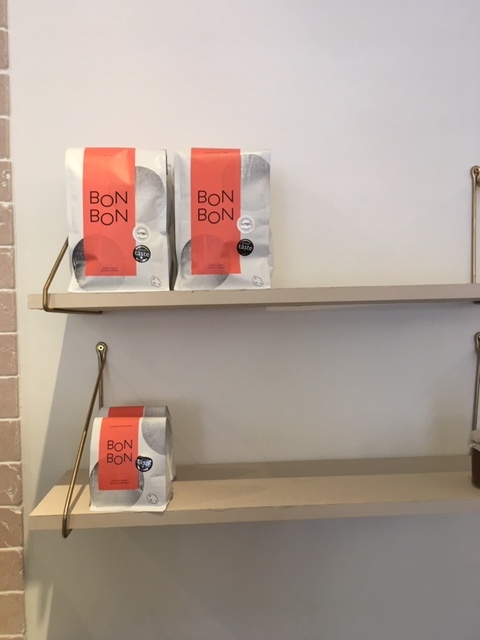 The business and its people acknowledge that in today’s society there is a demand for ethically sourced ingredients and options for people of all dietary specifications, and this is certainly clear from our experience at The Early Bird. Both of us being vegetarian, we did not feel that we missed out in the slightest in spite of having certain ingredients removed or substituted. Emily was catered for excellently being lactose intolerant considering that the establishment is primarily advertised as a bakery, a business known for packing its goods with lashings of butter and cream. Although neither of us were aware before eating of the expertise of Tim C, his ten years of experience in the industry was immediately apparent as we were served what was potentially the best avocado on toast we had ever seen in our lives. A far cry from the standard brunch that can be coughed up by almost any cafe in town, the smash on sourdough was served with slow roasted tomatoes, pickled radish, dukkah spice and a beautifully poached egg. Whilst admiring the colours and spices that adorned the dish, we were even more astounded by the way that the spices actually worked - we were intrigued by the pickled radish, but its sweetness in combination with the spices turned out to be a match made in heaven. 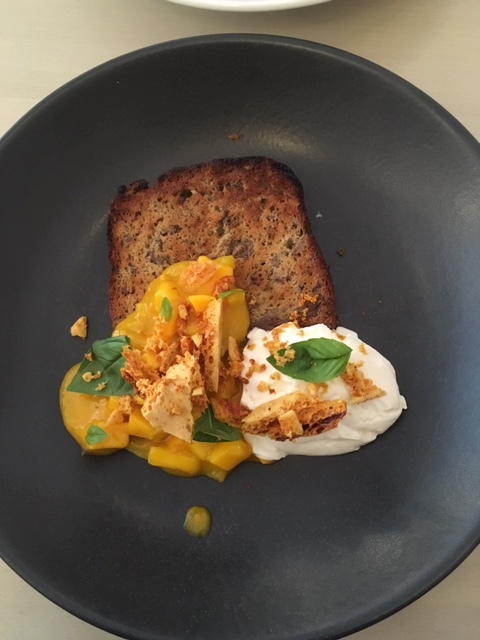 As Emily tucked into this dish, we were also served a beautiful twist on a classic: french toast made with banana bread, served with mascarpone, a mango and yellow pepper compote, dusted with basil and honeycomb. Whilst neither of us had ever considered mango and yellow peppers to be similar in any way other than their gorgeous yellow pigment, in combination with the other ingredients, they were an incredible novelty to the palette, taking the dish to a new level of brunching. The fragrance of the basil with the sweetness of the honeycomb and pepper illustrated how these guys are about taking the genre of brunch, and delivering it with mature and fresh twists, that no chain menu could keep up with. As if these dishes weren’t enough to leave us both astounded and stuffed, we were also provided with the best scrambled eggs either of us had ever had, (eggs definitely not churned out in case of a big order, they were fresh and bouncing), accompanied by sourdough toast (a winner in any dish), peppers, toasted almonds, and chilli. Whilst delicious to the eye and Instagram, all three of these dishes were an approach to the whole culture of brunch outside of anything either of us had experienced. The chef takes conventional dishes as simple as scrambled eggs on toast, and through fresh ingredients, spices, and some crafty looking plates, turns the dish into something beyond your expectations or anything your brunch-versed buds have experienced before - all a brief journey from your doorstep, perfect for a Saturday excursion when family or friends come to visit, or to celebrate the end of a hectic week. As we tucked into Cherry and Rhubarb tea, (cake in a cup!) and breakfast tea with dairy-free milk (no added extra!) served in the most beautifully minimal tea-ware either of us had seen in Birmingham, and expressed how full we both were, neither of us could say no when Joe offered us a look at the cake selection. Although advertised as a bakery, both of us underestimated the artistry in these cakes. However, having discovered Tim C to be a pastry chef who has featured in the likes of Birmingham Coffee Festival and Digbeth Dining Club before, the level of professionalism made sense. Lydia was treated to a ‘Banana, Passionfruit and Lime Cruffin’ - an incredible marriage between croissant and muffin. The outside was incredibly crispy, yet the thick and creamy filling did not make this soggy at all. The flavours were citrusy and intense and bounced well off of each other, making this definitely worth the indulgence. Emily tucked into a beautiful ‘Vegan Passionfruit, Raspberry and Lime Drizzle Cake,’ which is potentially one of the best vegan bakes she had eaten in Birmingham. Covered in dainty iced daisy’s and accompanied with a pipette filled with drizzle for you to insert yourself, the cake’s texture was not stodgy in the slightest, in spite of the lack of conventional cake ingredients such as eggs and traditional fats. The sweet and citrus flavours, combined with a tart raspberry middle, was so gorgeous and the perfect end to a heavenly brunch. Well and truly stuffed, we sat back and just watched the bakery for a few minutes - digesting what an utter success this new-to-the-scene business is, opening the 27th of November, just last year. There is something that cafés and eateries can’t appropriate, and that is authenticity when it comes to people and food. The Early Bird Bakery, ooze a desire to serve, know and nourish people in every sense. The power of art, hospitality, and food are nestled nicely into this little bakery, sitting comfortably and confidently, on Kings Heath High Street. We can not recommend this little spot enough, for coffee, cake, or a full blown brunch like we had. 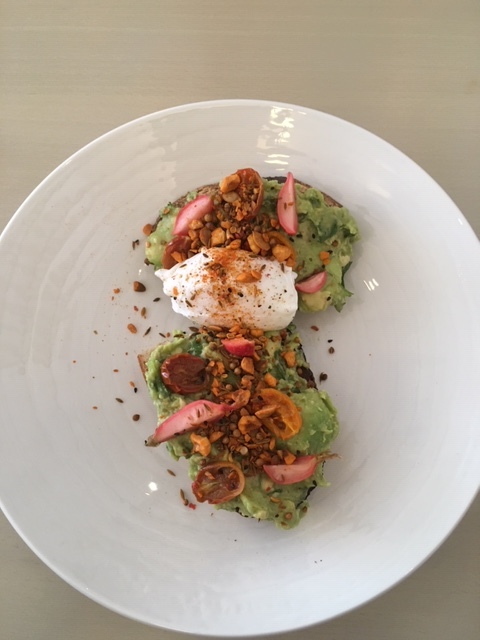 From Smashed Avocado at only £6.50 and a coffee averaging at about £2.60, there is no need to see a date here as a particular financial treat. Joe and his team are also willing to adjust dishes to fit allergies and dietary requirement s- just, tick, tick, ticking all the boxes! Thank you to The Early Bird Bakery.